Notwithstanding quirks in the Social Security system, public policy has sharply reduced the reward to work since 2007. On Monday, the Economix blogger Nancy Folbre helped explain some of the complex factors that determine the rewards of working. Among other things, she noted the roles of work experience and Social Security benefits, both of which are examples of future consequences of working in the present. This week I will examine Social Security and Medicare benefits from her forward-looking perspective, and in a future post I will examine work experience. Professor Folbre says the payment of Social Security payroll taxes confers a benefit on the taxpayer in the form of additional Social Security benefits later in life. Indeed, the Social Security Administration calls the payroll taxes “contributions,” although employers are subject to penalties and even prosecution if they fail to deliver the “contributions” on time and in the legally prescribed amounts. Technically, a worker’s lifetime history of taxable earnings, rather than the taxes themselves, traditionally determine a person’s old-age benefits, with more lifetime earnings sometimes resulting in more benefits (this book by the longtime Social Security actuary Robert J. Myers has all the details). A classic paper by Martin Feldstein and Andrew Samwick was able to quantify the the link between lifetime earnings and old-age benefits as it was in 1990, assuming that Social Security rules would be unchanged over the next several decades. They found that secondary earners — in their view, spouses with significantly lower lifetime earnings than the other partner — would receive no future old-age benefits as a consequence of working, but that the value of benefits to patient, primary earners nearing retirement could be significant, especially if they were married. If payroll taxes were always the same share of taxable earnings, we could ignore the distinction between the two for the purposes of quantifying incentives to work. But payroll tax rates have varied over time, most recently with the partial payroll tax holiday of 2011 and 2012 (interestingly, the Obama administration refers to the two-point reduction as a “tax cut”). Because the payroll tax rates are higher now than in 2012, a person moving earnings from 2012 to this year would increase his payroll tax but not increase his Social Security benefits. That’s why I count the entire payroll tax cut as an increase in incentives for as long as the cut lasted, even if the rest of the payroll tax confers the benefits that Professor Folbre contends. If all we wanted to know was the amount by which incentives changed over the last 10 years or so, Professor Folbre’s assertion about the future pension benefits conferred would hardly be relevant, unless we thought that the link between present earnings and future benefits had been changing during that time frame. I agree with Professor Folbre that the best quantitative estimate of marginal tax rates would account for the future consequences of working in the present, but writing in 2013 I am not willing to follow Professors Feldstein and Samwick and assume that Social Security rules will remain unchanged for the remaining lifetimes of today’s workers. In one way or another, we can expect health benefits or cash benefits for the elderly, or both, to be taxed or means-tested more than they are under current law. Democrats have suggested means-testing Social Security and Medicare, with the likely result that people who worked and saved more during their lifetimes will find themselves with fewer benefits from those programs, compared with people who worked and saved less. Republicans have proposed means-testing Medicare, as part of transforming it to a health insurance premium-support program. The common denominator here is means-testing and the marginal tax rates that go with it. Professor Folbre is unwilling to assume that “taxpayers derive no marginal benefits from programs such as Social Security.” But that’s hardly relevant for understanding how incentives evolve over time. Based on the considerations cited above, my guess is that the effect of working in the present on future Social Security and Medicare benefits was once somewhat positive (primary earners) or zero (secondary earners), and for primary earners has become less positive (or even negative) over time. By approximating these changes as zero, my work has thereby understated the amount by which marginal labor income tax rates have increased since 2007. Regardless of whether redistribution is achieved by collecting more taxes from families with high incomes, providing more subsidies to families with low incomes, or both, an essential consequence is the same: a reduction in the reward for activities and efforts that raise incomes. New and revised federal programs do exactly that, in myriad ways, and will be doing so for the foreseeable future. The odds of a one-year delay of the individual mandate have been rising since October 1. 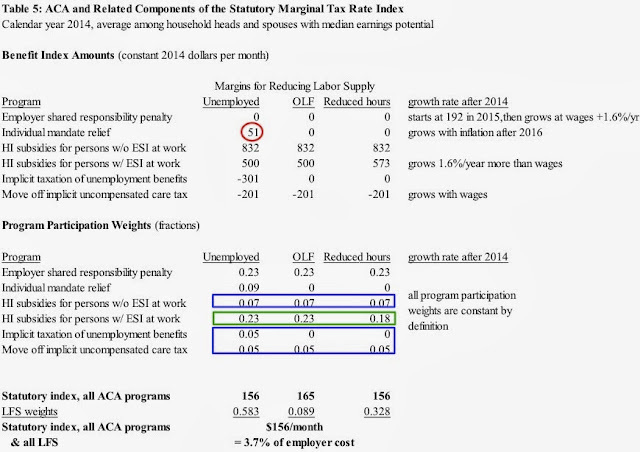 The work I did in August 2013 assumed that the individual mandate took effect 1/1/2014 as scheduled by the original law, and that the addition to marginal tax rates on that date would average 3.7 percentage points. Table 5 gives some of the details of the derivation. The colored circle and rectangles show the ingredients that would change if the individual mandate were delayed beyond 12/31/2014. The red circle entry would become zero, which by itself would reduce the bottom line from 3.7 percentage points to 3.6 percentage points. I based my estimates of the green rectangle's three parameters on rollouts of Medicare, Medicaid, and ARRA COBRA subsidies, none of which were supported by an individual mandate. Moreover, the most important of the three entries is the first one, representing unemployment, and I expect that the individual mandate will not apply to many unemployed people anyway. Arguably the green rectangle's entries would be the same without or without the individual mandate. The blue entries are based on expectations of take-up of the exchange plans among workers who are not offered affordable coverage at work. Perhaps they would be cut by one third by eliminating the individual mandate for 2014, which would put the bottom line at about 3.3 percentage points. 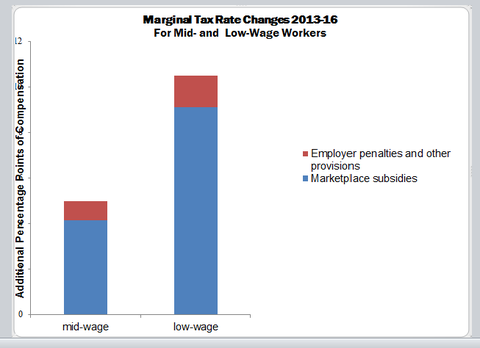 More important than the individual mandate is the take-up rate of subsidized exchange plans. If healthcare.gov fails and take-up was 1/3 of what was expected, the bottom line with the individual mandate would drop from 3.7 to 1.8 percentage points (see especially Table 8 of my paper). The health of healthcare.gov and the health of the labor market are inversely related. The best industrial organization economists understand that products have many attributes. Coca-Cola is not simply a substance for quenching consumers' thirst. Consumers value its brand image, familiarity, packaging, etc., which is why it dominates competing sodas despite tasting the same. 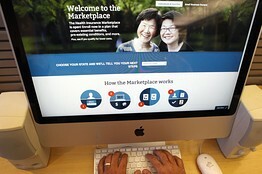 I urge Obamacare critics stick to legitimate critiques rather than fabricating them through economic misunderstandings. For example, healthcare.gov was supposedly built at a cost of over $600 billion. Although I agree that healthcare.gov has delivered hardly any value by enrolling (a handful of) people in health insurance, we cannot conclude that the social value created by Obamacare since October 1 has been negative. First, the social purposes served by healthcare.gov go beyond enrolling people in health insurance, just as the social purposes of Coca-Cola go beyond quenching thirst. I am no fan of Obamacare and thereby don't bear the burden of proof of said value, but can point to entertainment value as an example. Many times lousy unknown films make $50 million in a few months, and that understates the social value created because intellectual property like films cannot monetize all of the social value. I'm confident that healthcare.gov has created more aggregate entertainment than, say, The Smurfs 2 or The Last Exorcism Part 2, which, in the span of a few months, each generated social values in the $20-120 million range. You might say that the enjoyment is offset by the pain experienced by Obamacare supporters when they view such videos. But as of October 1 there weren't that many Obamacare supporters (why would NBC and other major networks feature this kind of entertainment if it were offensive to half of the potential viewers? ), and the few of them who exist can and do choose to ignore the allegedly major problems with healthcare.gov. Like international trade, farce is usually a positive-sum game. My best guess is that the entertainment value generated by healthcare.gov during October 2013 is about $200 million, with more value forthcoming, albeit at a diminishing rate. Second, healthcare.gov didn't cost $600+ million to build. Nobody knows for sure (that's part of the entertainment value! ), but healthcare.gov appears to cost $125-150 million. If healthcare.gov created value only via entertainment, it has already generated a surplus in the neighborhood of $50 million. As I said, healthcare.gov has still more valuable product attributes. Somebody needs to quantify the value of reminding the public (and economists) about "Bright Promises, Dismal Performance" better than Milton Friedman ever did. Who knows what corruption might be uncovered in the Congressional hearings -- corruption that would have persisted undetected but for healthcare.gov. If and when the Affordable Care Act is executed as planned, it will leave few members of working families uninsured. About 31 million members of nonpoor working families are without health insurance (according to my calculations from the Census Bureau’s current population survey). An important reason they do not have private health insurance coverage is that, in one way or another, they find it too expensive. Their employer may offer health insurance, but they decline coverage because the premiums are too much. If their employer doesn’t offer insurance, the uninsured workers are, judging from their behavior, unwilling to switch to an employer that does offer health insurance in exchange for lower cash pay (of course, finding such an employer may not be easy and may require a move across state lines, but that’s my point: getting private insurance is costly). The Affordable Care Act has at least two provisions to make insurance cheaper to workers who have so far been uninsured, compared with what employer insurance would have cost them in previous years, and these will take effect in the next couple of years (or whenever the federal government gets its systems running, whichever comes later). The first provision is the “individual mandate penalty” for being uninsured, which will eventually reach the greater of 2.5 percent of husband-and-wife income, or $695 per uninsured family member (up to three, with uninsured children counting half, and the $695 indexed to inflation). Undocumented immigrants are not liable for the penalty. The penalty effectively makes insurance cheaper because people can avoid it by getting insurance. In effect, all nonpoor legal residents pay the penalty, but people who purchase health insurance get their penalty applied toward their health insurance premiums. The law’s premium assistance tax credits are another provision that makes insurance cheaper, at least for uninsured nonpoor people living in households below 400 percent of the federal poverty line. These two provisions are a potent combination — and might be reinforced by the prospect of Internal Revenue Service enforcement of fines due. I estimate that nine million of those who would have been uninsured without the law will find their own health insurance to be free, or even better, in the sense that their penalty (in the years 2016 and beyond) for being uninsured exceeds the premium that they probably would pay on the law’s new health insurance marketplaces (I use the Kaiser Family Foundation calculator to make these estimates because the marketplaces are not yet operational). As taxpayers, each of these families will be helping to pay for other people’s health insurance; those taxes will be owed regardless of what the family decides about its own insurance. Without the individual mandate, those nine million people might be tempted to remain uninsured. Although the remaining 22 million nonpoor workers (and their dependents) will have to pay something to have health insurance, most of them will find insurance to be cheaper than it was before the Affordable Care Act. In addition to the nine million who will find insurance to be free (in the sense defined above), another 13 million will find insurance to be at least 25 percent cheaper than it was to get employer insurance before the law passed, and they are therefore more likely to purchase it. The individual mandate is politically unpopular, and we don’t yet know how vigorously the Internal Revenue Service will enforce it. The law precludes the I.R.S. from criminally prosecuting taxpayers who refuse to pay their penalty, and on this basis some observers have predicted that the I.R.S. will collect hardly any penalties. Others believe that the I.R.S. can get its penalty revenue if it tries hard enough. After all, banks and other private-sector creditors cannot criminally prosecute either, yet they still manage to collect from most of their borrowers. Senator Tom Coburn, Republican of Oklahoma, explains how the I.R.S. can add penalties and interest to unpaid individual mandate penalties and establish a lien against the delinquent taxpayer’s property so that, should the property be sold, sales proceeds can go toward paying the I.R.S. The I.R.S. can also press delinquent taxpayers for payment. The Affordable Care Act prohibits the I.R.S. from filing a Notice of Federal Lien, which would give its lien priority over other liens, but, again, that makes the I.R.S.’s collection toolbox more like the toolbox that private-sector creditors have. For all of these reasons, the individual mandate can be enforced and thereby help discourage millions of people from going without health insurance. As people age each year, that tends to increase average ages. At the same time elderly people die and babies are born, and that tends to decrease average ages. The combination of these two forces can keep the average population age constant over time. The baby boom from the late 1940s to early 1960s changed this calculus, because the number of babies born in those years was well above normal. Average ages fell when the baby boomers were born, and have risen thereafter because the baby boomers’ birthdays tended to outweigh the arrival of subsequent birth cohorts. For decades, people tended to reduce the amount they worked – especially through retirement – as they reached 62 and beyond, because their health declined, they became eligible for Social Security, they wanted to spend time traveling or they looked forward to extra time with grandchildren. Still, retirement behavior need not reduce total workers per capita because people turning 62 can be replaced by young people coming into the work force. In about 2008, the first baby boomers started to reach normal retirement ages. Their numbers are so large that the people coming out of school are too few to fully replace them. This historically unusual rate of population aging is expected to reduce employment per capita. You might say that the natural rate of employment has been falling in recent years, for labor supply reasons that have nothing to do with the recession, financial crises and other economic events. For this reason, in my book and elsewhere I look at labor time series that are adjusted for population aging. 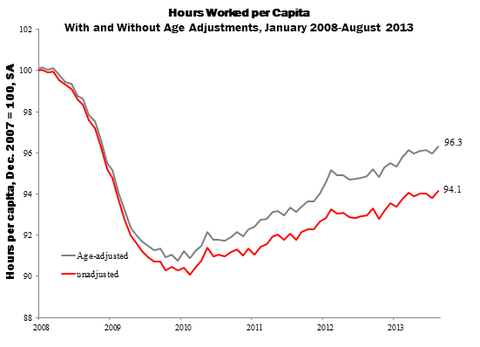 The chart of work hours per person below is an example. The chart is on an index scale, with the last month before the recession normalized to 100. An index value of, say, 90, means that hours per person were 90 percent of what they were in December 2007: a drop of 10 percent. The red series shows that, without any adjustment, the labor market is still about 6 percent below what it was: less than half recovered from its 10 percent drop. But the recovery is more significant if we adjust for age: the gray series had reached 96.3 by August 2013. In other words, two of the six percentage points of the current depression of the red series is a consequence of population aging between 2007 and 2013. Because the Federal Reserve and other policy makers cannot stop the aging process and the labor supply shifts that go with it, they should understand that their job of helping recovery will be finished before the red series gets back to 100. Economists disagree about many things, but they seem to agree with the basic idea that the lack of recovery is partly attributable to population aging, and that policy makers cannot stop the aging process. Paul Krugman, for example, notes that we need to adjust for demographics. He uses a slightly different adjustment, but his measure and mine agree that population aging by itself depresses the usual labor market indicators by 1 or 2 percent. But aging is not the only change affecting labor supply. Marginal tax rates have increased five percentage points since 2007 and will increase another five percentage points over the next 15 months, a trend attributed especially to expansions in health and other safety net programs. By 2015, a typical worker will keep only half of the value created by employment, compared with 60 percent kept before the recession. Economists have traditionally recognized that a 17 percent reduction in the reward to working (from keeping 60 to keeping 50) would significantly contract the labor market, and do so at least as much as the 2 percent that the aging of the baby boom does. Yet this time many economists are reluctant to acknowledge marginal tax rate increases, even though marginal tax rates affect labor supply in many of the same ways that aging does. Perhaps the economists who are silent about marginal tax rate hikes are worried that acknowledging the new rates would overshadow their well-intentioned origins: helping the poor, the unemployed and people without health insurance. Professor Krugman, for example, says life is too short for him to look closely at my criticism and at the marginal tax rates I’ve measured, and doesn’t indicate that he’s looking at anyone else’s measures either. He’s not the only one: I have visited several Federal Reserve banks since 2009, and hardly any of the economists there seemed to be aware of what’s happening to marginal tax rates. The Federal Reserve cannot reverse the tax rate increases any more than they can reverse the aging process. Perhaps Congress should ask Janet Yellen, nominated as chairwoman of the Federal Reserve, what she knows about changes in tax and retirement rates, and what they say about the future of the labor market. One of the myths about explicit and implicit taxes is that Americans have no clue what's going on, and cannot react to tax rates of which they are purportedly ignorant. That's wrong on many levels, one of which that less than two weeks after the Obamacare launch, personal finance columnists began advising readers to watch their income and consider cutting it in order to enhance their subsidy. You might attempt to reconcile these two by assuming that nobody reads such columnists, except that the one column I linked has been shared thousands of times on facebook and I assume read by tens of thousands. If you want to measure the incentive for working, the sales tax needs special consideration. (B) Labor supply behavior. In order to understand how labor supply behavior changes in response to tax rate changes, to a first approximation all we need to know is the percentage change in [(1-t)/(1+s)]. Over the past 10 years, U.S. sales taxes (levied at the state and local levels) have hardly changed, which means that the time series for t, which is what I showed in my WSJ article, is all we need to calculate the percentage change in [(1-t)/(1+s)]. John Cochrane explains this further on his blog. Today I gave an example, from the U.K., where sales tax rates were NOT constant. The U.K. example also reminds us how the sales tax is included in the CPI so that, if you do have a marginal tax rate measure inclusive of the sales tax, you should NOT multiply it by a real wage deflated by the CPI because that would double-count the sales taxes. The MTR series that I showed in my WSJ article (and available here in excel format) does not include sales taxes, and therefore can be multiplied by wages deflated by the CPI. Indeed, economists researching wages should make this multiplication more often than they do (which is hardly ever), because taxes are part of the functioning of prices in the labor market. (C) Welfare analysis. If you want to calculate the new deadweight losses from new income taxes, you have to consider the sales tax and any other other wedge between total income and disposable income, even if the sales tax were constant over time, because the behavioral changes avoiding the new income taxes have the side effect of reducing sales tax revenues. That's what I do in the small section of my book (Appendix 4.3) that quantifies labor market deadweight losses. Between 2009 and 2011, the value-added tax in Britain increased to 20 percent from 15 percent. (The value-added tax is essentially a national sales tax.) Because the tax is part of the overall price of essentially anything bought in the country, it was no surprise that the rate of inflation of prices on consumer goods was elevated during those years as businesses passed on the cost of the taxes they paid to their customers. In many circumstances, wages roughly keep up with consumer price inflation as the sellers of consumer goods use their extra revenue to compete for workers. But wage inflation is not guaranteed when consumer price inflation comes from sales tax increases, because the extra revenue goes to the public treasury in the form of sales tax receipts rather than going to the sellers of consumer goods. A recent study of wages in Britain confirmed this: inflation-adjusted wages fell 4 or 5 percent in Britain between 2009 and 2011. While British workers saw their purchasing power eroded by the sales tax increase, the unemployed did not, because unemployment benefits in Britain are automatically indexed to inflation. Additional inflation of 5 percent meant a 5 percent rise in unemployment benefits. By giving a raise to the unemployed without giving a raise to workers, the added sales tax in Britain reduced the reward of working. The United States does not have a national sales tax. A few states did increase their state sales tax rates between 2011 and this year (others decreased it), but the national average increase since 2007 has been only a couple of tenths of a percentage point. Nevertheless, adjusted for taxes, subsidies and inflation, wages are lower in the United States, too. As I showed in a post last year (see especially the second chart), public policies in the United States reduced real wages by increasing the incomes of unemployed people through new unemployment benefits, food stamp expansions and other increases in benefits of the social safety net. As long as the United States and Britain retain their wage-depressing public policies, neither country should expect its labor markets to return to what they used to be. excel spreadsheets with the marginal tax rate series are here (use the version with "update" in the file name). My marginal labor income tax rate series are available in electronic format. A new wave of redistribution will arrive in America on Jan. 1, primarily thanks to the Affordable Care Act. The president's health-insurance plan forces those who hire, work and produce to pay full price for health care, while creating generous discounts for practically everyone else. This second redistributionist wave of the Obama era will follow a first wave of tax hikes, additional unemployment benefits, food-stamp expansions, waived work requirements for welfare benefits, etc. These measures were supposed to be temporary, intended to help people cope with the recession. The recession officially ended in mid-2009, but many of the administration's measures continue. Regardless of whether redistribution is achieved by collecting more taxes from families with high incomes, levying employment taxes on businesses, providing more subsidies to families with low incomes, or all of the above, an essential consequence is the same: a reduction in the reward for working. In a National Bureau of Economic Research paper issued in August, I quantify the combined effect of the two redistribution waves and higher payroll taxes on the financial reward for working. The chart nearby shows an index of marginal tax rates for non-elderly household heads and spouses with median earnings potential. The index, a population-weighted average over various ages, occupations, employment decisions (full-time, part-time, multiple jobs, etc.) and family sizes, reflects the extra taxes paid and government benefits forgone as a consequence of working. The 2009-10 peak for marginal tax rates comes from various provisions of the "stimulus" programs in the American Recovery and Reinvestment Act of 2009 and the extension of unemployment benefits to 99 weeks in some states. At the end of 2012, the marginal tax rate index reached its lowest value since 2008: 43.9%. A little over a year later (January 2014), the index will be close to 50%, driven up by the expiration of the payroll tax cut and multiple provisions of the Affordable Care Act. The ACA employer penalty, delayed until 2015, adds more than a percentage point in that year alone, while other ACA provisions strengthen their disincentives for the various reasons cited above. By 2016, the index exceeds 50%, which is at least 10 percentage points greater than it was in early 2007. The 50% rate is even higher than the rates that prevailed when the so-called Recovery and Reinvestment Act's redistribution was at its peak. 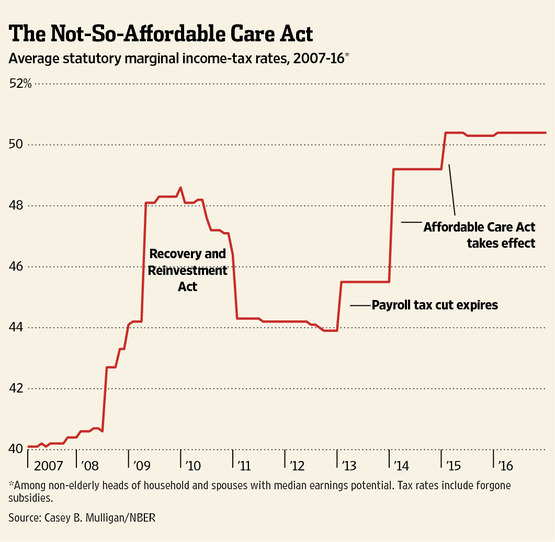 Without new federal legislation and a departure from the strategy of forcing workers and employers to finance everyone else's health care, the new 50%+ rate will not be a peak, but rather a new normal for tax rates. To appreciate the added burden that the two redistribution waves put on the labor market, look at what people keep, on average, when they decide to retain or accept a job, or to take on a longer work schedule. Before the recession, a decision to work would benefit public treasuries by an amount equal to 40% of the compensation from the job. The worker and his family got the other 60%. In the years 2015 and beyond, full-time workers with median incomes will keep only half of the compensation created by their decisions, with the other half going to the government in the form of additional taxes and savings on subsidy payments. By keeping 50% rather than 60%, workers will find that the reward for holding a job will have fallen a damaging 17%. Advocates of redistribution try to perpetuate the income-maximization fallacy that business continues as usual as long as tax rates are less than 100%, because receiving even 1% of your compensation is supposedly better than getting no compensation at all. But even if full confiscation were the only way that taxes would depress the labor market, recall that the nearby chart is just an average: The average rate rising to 50% and above involves millions of people with rates far higher. America absolutely must have taxes and safety-net programs, even though they reduce the reward for working. But advocates for the recent program expansions have failed to acknowledge that redistribution necessarily increases marginal tax rates and contracts the labor market. Don't be surprised if the second redistribution wave coincides with a recessionary double-dip. Mr. Mulligan is a professor of economics at the University of Chicago and the author of "The Redistribution Recession" (Oxford, 2012). 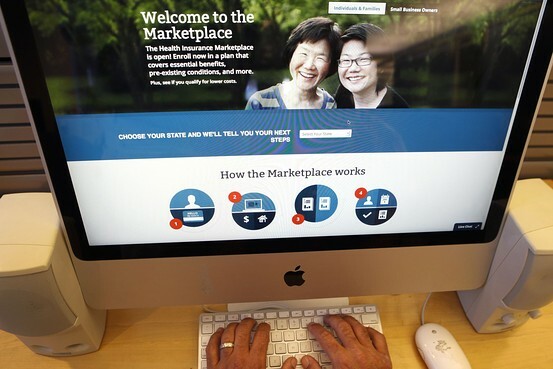 Copyright, Dow Jones & Company, Inc.
Beginning this week, families can use the Affordable Care Act’s marketplaces to enroll for health insurance coverage that begins Jan. 1, and in many cases receive federal assistance with their premiums and other health costs on the basis of their expected income for calendar year 2014. These new rules will make it less rewarding to be a full-time worker and a little less burdensome to be unemployed or underemployed. 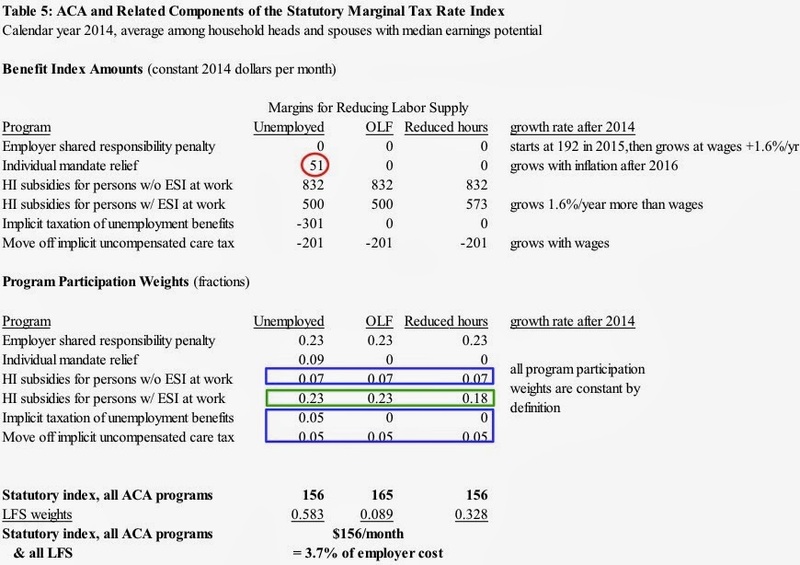 In my testimony in June before the Subcommittee on Human Resources of the House Ways and Means Committee, I quantified these new disincentives in terms of marginal tax rates — the percentage of compensation lost from paying taxes and replacing benefits associated with not working. The group I looked at was non-elderly household heads and spouses whose earnings abilities – that is, the amount that they earn when they are working full time – are in the middle of the distribution, earning roughly $800 per week when the work is full time. Such workers (hereafter “midwage workers”) will see their marginal tax rates increase by an average of five percentage points between now and 2016, taking into account that many people will not take part in programs for which they are eligible for help. Before the Affordable Care Act, the compensation for each additional hour of work by a midwage worker was, on average, split 55 percent for the employee and 45 percent for the government (the government got its part by receiving more taxes from the employee, and paying fewer benefits, such as unemployment insurance payouts and food stamps, to the employee). Under the act, the split will be 50-50. The unemployment rate, the employment rate and the propensity to work full time are usually measured nationwide, with every adult counting in the average regardless of whether he or she is a low-wage worker, a high-wage worker or somewhere in between. It’s worth giving attention to midwage workers because, by definition, much of the population is fairly close to the middle. But is also informative to look at low-wage workers, because they are more likely to fall into poverty and their employment patterns may be more sensitive to incentives. It turns out that low-wage workers will also see a reduction in their reward to work over the next couple of years, and to a greater degree than workers in the middle will. The chart below compares the five-percentage-point result for midwage workers and its components, with the tax-rate changes for low-wage workers (by which I mean workers who earn roughly $550 per week when they work full time, which is roughly twice minimum wage). Work incentives for low-wage workers are eroded more than 10 percent of their compensation over the next couple of years, compared with 5 percent for midwage workers. Before the Affordable Care Act, the compensation for each additional hour of work by a low-wage worker was split 50 percent, on average, for employee and 50 percent for the government. Under the law, it will be 39-61. One reason that low-wage workers will have a greater shift in their incentives is that, because they earn less, a given dollar amount is a greater percentage of their compensation than it would be for a midwage worker. More important, low-wage workers will qualify for larger dollar subsidies in the marketplaces than midwage workers will. Working full time or spending fewer weeks unemployed will mean less, or even zero, assistance with health expenses. In other words, some good news from the new marketplaces is that low-wage workers will be given a lot of assistance with their health expenses. But that assistance has the unfortunate consequence of higher income taxes on low-wage people: working more rather than less will not pay as well under the Affordable Care Act than it does now. The Biggest Bargaining Chip Ever? Obamacare is not too popular, and the Obama administration (like most administrations) is comprised of politicians who normally pay attention to such things. Obamacare is a logistical nightmare, and even proponents cannot rule out the possibility that it will shrink the economy. For sure, if the law goes ahead, some of the promises from Obama administration will prove to be false and embarrassing. Yet the convention wisdom is that the Obama administration really wants Obamacare to go ahead. How can that conventional wisdom be reconciled with the facts above? One interpretation -- the conventional interpretation I guess -- is to assume that the Obama administration is simultaneously (a) obsessed with the "legacy" of starting "universal" health care, and (b) sufficiently over-confident or risk loving that they assign little probability to the nightmare scenarios that would make the Obamacare legacy not worth owning. A second interpretation is that the Obama administration only wants to appear this way, so that it can sell delays or repeals of Obamacare to the Republicans and charge them an exorbitant political price. E.g., agree to delay or repeal Obamacare in exchange for (a) 2-5 percentage point increase in taxes on the "rich" or on big businesses and (b) planning to work on a "bipartisan" health care "solution" that would reduce the number of Americans without health insurance below a threshold (say 30 or 40 million). Under this scenario, the Obama administration does not have to worry much about Obamacare logistics, or (ignoring those employers who have already changed their way of doing business in expectation of Obamacare -- they can always go back to business as usual) the possibility of significant economic damage, because it does not really plan to carry this thing out. This scenario has few, if any, broken promises. This scenario also has a good cop/bad cop version with President Obama sticking to his support for Obamacare but Mrs. Clinton and a few others agreeing, for a price (see above), to talk him out of it. What do you think? If the second interpretation is correct, what should the Republicans be doing? Should Democrats "sell" Republicans control of Obamacare (repeal), or just rent it ("delays")?